Annuals. Trichomes of leaves primarily 3- or 4-rayed, some-times mixed with 5-rayed ones, 2-rayed trichomes primarily on stem and pedicels. Stems erect, often branched distally, (ribbed), (0.7-)1.5-10(-15) dm. Basal leaves (withered by fruiting), similar to cauline. Cauline leaves: (median and distal) shortly petiolate or sessile; blade (lanceolate, linear, or elliptic-oblong, (1-)2-7(-11) cm × (2-)5-12 (-23) mm, base cuneate) margins usually subentire or denticulate, rarely sinuate-dentate, (apex acute or obtuse). Racemes considerably elongated in fruit. Fruiting pedicels divaricate or ascending, slender, much narrower than fruit, 5-13(-16) mm. Flowers: sepals oblong, 1.8-3.2 mm, lateral pair not saccate basally; petals yellow, narrowly spatulate, 3-5.5 × 1.5-2 mm, claw 1.5-3.5 mm, apex rounded; median filaments 2-3.5 mm; anthers oblong, 0.5-0.7 mm. Fruits suberect or divaricate-ascending, linear, straight, somewhat torulose, (1-)1.5-2.5(-4) cm × 1-1.3 mm, 4-angled, not striped; valves with prominent midvein, pubescent outside, trichomes 3-5-rayed, densely pubescent inside; ovules (20-)30-55 per ovary; style cylindrical, slender, 0.5-1.5 mm; stigma entire or slightly 2-lobed, lobes as long as wide. Seeds oblong, 1-1.5 × 0.4-0.6 mm; not winged. 2n = 16. Flowering Jun-Aug. Dry stream beds, moist areas, waste ground, fields, pastures, disturbed ground; 0-3000 m; introduced; Alta., B.C., Man., N.B., Nfld. and Labr. (Nfld. ), N.W.T., N.S., Nunavut, Ont., P.E.I., Que., Sask., Yukon; Alaska, Ark., Calif., Colo., Conn., D.C., Fla., Idaho, Ill., Ind., Iowa, Kans., Maine, Md., Mass., Mich., Minn., Mo., Mont., Nebr., Nev., N.H., N.J., N.Mex., N.Y., N.C., N.Dak., Ohio, Oreg., Pa., R.I., S.Dak., Tenn., Utah, Vt., Va., Wash., W.Va., Wis., Wyo. ; Europe; Asia; n Africa. Annual herb 20 cm - 1 m tall Stem: upright, usually unbranched, very hairy. Leaves: alternate, linear to oblong, mostly non-toothed, and hairy. Flowers: in a long, dense, branched cluster (raceme). Stalks widely spreading, slender, 6 - 14 mm long. Sepals four, 2 - 3.5 mm long. Petals four, pale to bright yellow, 3.5 - 5 mm long. Stamens six. Fruit: a long, narrow pod, upright to ascending, 1.2 - 3 cm long, four-angled, and hairy. Seeds in one row. 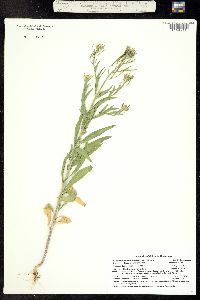 Similar species: The similar Erysimum hieraciifolium, E. inconspicuum, and E. repandum differ by having petals that exceed 5 mm long, sepals that exceed 3.5 mm long, and fruit that exceeds 3 cm long. Habitat and ecology: Introduced from Eurasia. In the Chicago Region, this is an uncommon but widespread weed of nitrogen-rich soils. It has become naturalized in many disturbed areas such as along roads, railroads, and in fields. Also found in barnyards, cultivated ground, and areas where grain has been accidentally scattered. Etymology: Erysimum comes from the Greek word eryomai, meaning "to help or save," which refers to the medicinal qualities of some species. Cheiranthoides means "like Cheiranthus," which is the genus name for the wallflower. This species prefers a muck soil and is fast becoming established in the lake area. Where it has become well established, it forms a complete and dense stand. I found a pure stand of it about three miles north of Albion, Noble County, in muck soil in a low place in an oatfield where the oats had been drowned out. Its habit of germinating late in the season permits it to occupy low places in hayfields, peppermint fields, etc. It is rather frequent on the spill banks of dredged ditches and in railroad ballast. There are no reports for the state south of the area shown on the map. Since none of the early authors reported this species, and the first report was in 1915, and because its habitat and its abundance where it is found suggest an adventive plant, I think that it has been introduced in Indiana.